Note the very distinctive yellow forehead contrasting with the chestnut neck and head. Most often seen in large flocks grazing by freshwater pools. 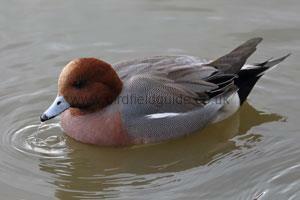 The Male Wigeon is a small rounded duck, in Winter it has a chestnut head, grey body and a pink breast. It has a distinctive bold yellow forehead. Breeds in Northern Europe and in the North of the UK where around 400 pair breed. Very widespread in Winter with up to 440,000 wintering throughout the UK. The Wigeon often forms huge flocks, most often seen grazing on grass around freshwater. 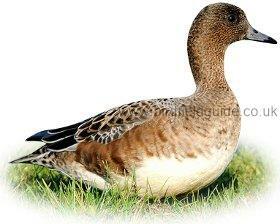 The Wigeon is a very vocal duck with a distinctive and haunting call. The Wigeon breeds on the edges of moorland pools and sometimes around lakes near woodland. During Winter it can be found in estuaries, freshwater marshes, flooded pasture and reservoirs. 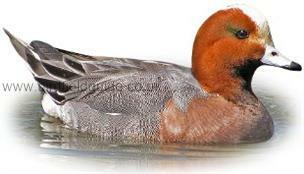 In Summer the Male Wigeon can be difficult to separate from the Female. The Male however retains his white wing flashes, visible here. The Male also tends to be redder than the Female and on this bird you can just see the pinkish/reddish colouration on the breast and neck. Mottled rust-brown body, white belly. Male and Female Wigeon, as often seen grazing on grass. 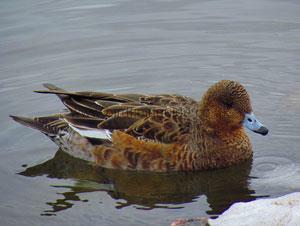 The Female Wigeon is a rust-brown bird with a white belly, it bill is similar to the Males, grey with a black tip.